Hey Yall! I'm just now discovering the wonders that is Angie's BOOMCHICKAPOP Popcorn! It seems like I'm the last person to know about this delicious non-GMO, gluten free snack. Like, where have it been all my life? These popcorns are highly addicting! I spent the whole weekend with my hands in several flavored bags of heavenly goodness! 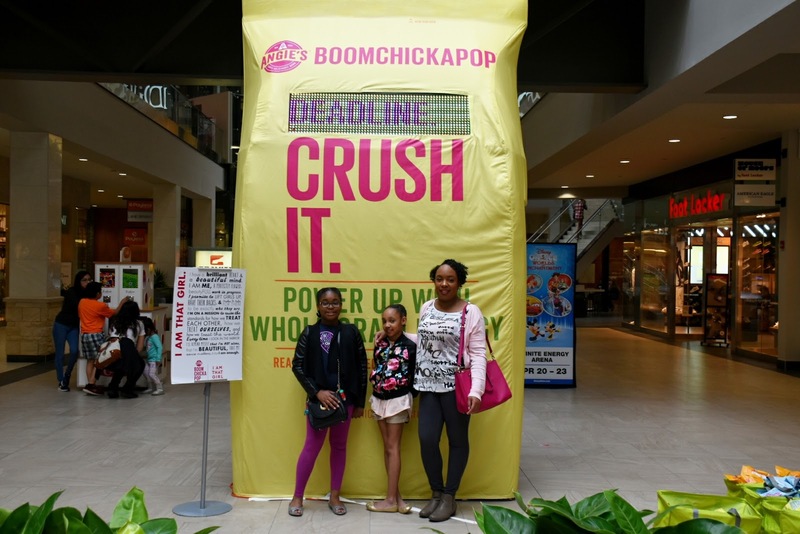 It all started with an email, an invite to attend BOOMCHICKAPOP's Positivity Tour introducing their five newest popcorn flavors and encouraging fans to celebrate positivity and "Crush It" by bringing the BOOM and inspiring others around the country to do the same. I thought this is a fun, tasty, uplifting event to bring my girls to, plus Michelle loves popcorn which is her go-to favorite snack. A week before the event, we were sent several bags of popcorn to try out beforehand. These colorful bags of real, simple ingredients, nothing fake popcorn is packing with flavor! At first, before trying them out, I thought the flavors would be lacking with a bad aftertaste due to popcorns being whole grain and gluten free. Boy, was I wrong! Honestly, the popcorn tastes even better than the unhealthy ones you find in stores and movie theaters; I can eat all of these BOOMCHICKAPOPS without feeling the least bit guilty. When I have a craving for something to snack on, I'll be eating a bag of BOOMCHICKAPOP! It all started back in 2001, when Angie and her husband Dan started popping kettle corn in their garage in Mankato, Minneapolis. They wanted to teach their kids the value of hard work, but still, have a little fun along the way. They wanted a snack they felt good about feeding their children with flavorful, real ingredients found in a kitchen, not a lab. Snacks packed with energy, not guilt. 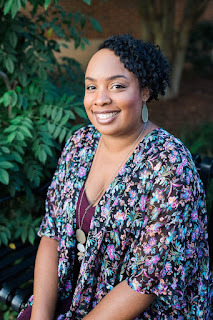 I love hearing about family success stories! Inspirational! At the event, Michelle and I (minus Lauren, she didn't want to) stepped inside a life-sized bag of Angie's BOOMCHICKAPOP and recorded on video inside what we want to "Crush" this year, check out our video on Twitter. Oh yeah, and guess what happened during the event! I had a chit-chat with the media representative in regards to Angie's BOOMCHICKAPOP brand on how it all started, and I shared with him how Michelle is totally obsessed with eating popcorn. But he had something even better in-store for us. Since Michelle has a birthday coming up, the rep hooked her and her classmates up with bags of popcorn for her class birthday party! When Michelle got home, she hopped on her tablet to video chat with her friends to tell them about the big news of Angie's popcorn she'll be bringing to school. Now, since the word is spreading about Michelle's prized birthday stash, she's bringing the popcorn in before her big day! So, you all are probably wondering, which one is my favorite flavor? Hmm....it's hard to choose, honestly. They are all equally good! But if I have to narrow it down to one it would be Sweet & Salty Kettle Corn we tried at the event for the win! Disclosure: I was given these popcorns for free, all thoughts and opinions are my own.Post contains Amazon affiliate links. 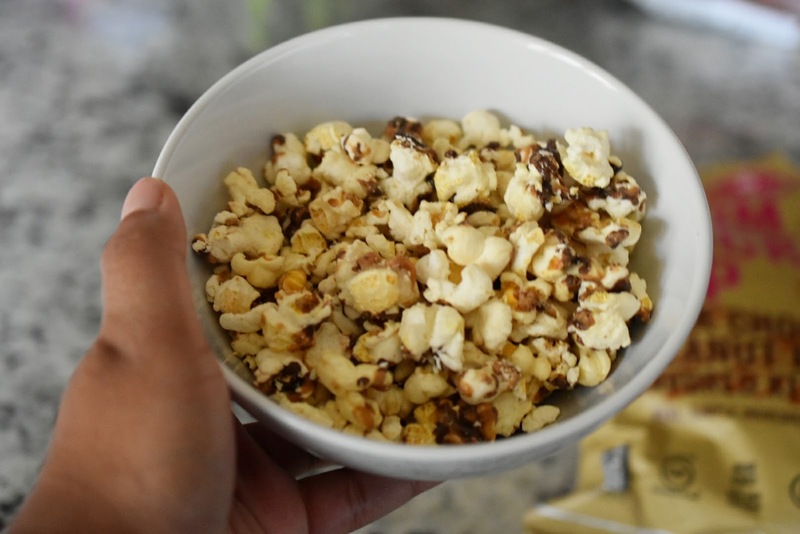 Have you eaten Angie's BOOMCHICKAPOP Popcorn before? If so, what's your favorite flavor? Pick up some, you'll like it for sure. I will admit though, some of the popcorn got stuck in my teeth, but not as bad as other popcorn brands. Looks like a great brand. You always find the best! 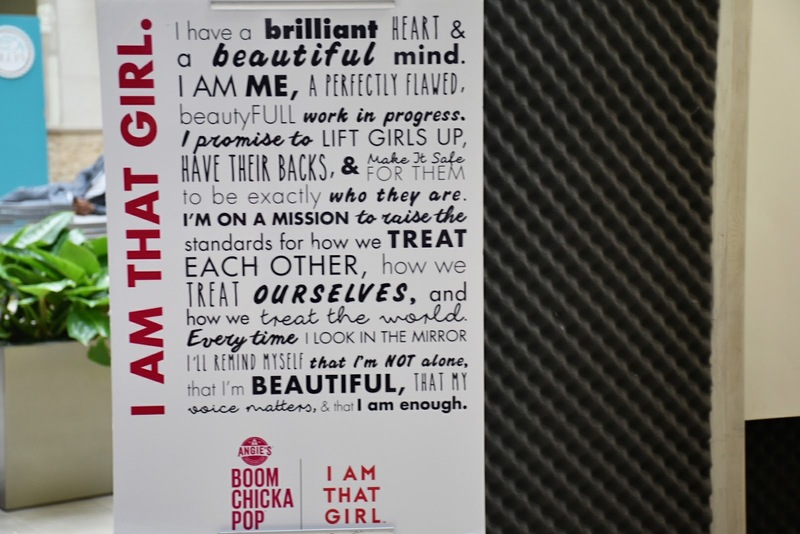 Go get you some girly, you'll love this popcorn brand! OMG look at that big bag of popcorn! My daughter has been really enjoying this brand lately.